SAN LUIS OBISPO, Calif. — (April 13, 2015) — The San Luis Obispo Marathon, Half Marathon + 5K presented by LeftLaneSports.com has announced its elite fields which include defending Marathon champions, event record holders and engaged couple Ryan Neely & Kimberly O’Donnell, from Walnut Creek, Calif. as well as local talent such as Van McCarty, the inaugural Marathon winner, and Erin Tracht. The 4th event edition, a San Luis Obispo running tradition, will be held on April 24–26. In the 26.2 mile race, Neely, 25, who recently finished third at the Oakland Marathon (2:30:12), will face Kenyan Peter Kemboi, who sports a marathon personal record of 2:19:26 from 2011; Mexico’s Juan Richardo Jaquez (2:28 PR); top Master and local Van McCarty, 44, the 2012 SLO Marathon champion, who placed second last year in 2:38:44, and 2013 SLO Marathon champion and 2014 Half Marathon winner Joe Thorne from nearby Grover Beach. 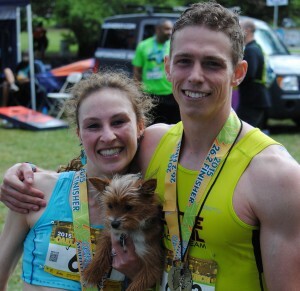 Last year, event records were set in the Marathon by Ryan Neely (2:34:47) and Kimberly O’Donnell (3:04:34) and the Half Marathon by Joe Thorne (1:12:19) and Kara Thorne (1:21:08). The 2015 prize money, sponsored by LeftLane Sports and the SLO Marathon + Half, totals $3150 and will be awarded to the top 3 per gender in the Marathon ($600, $300 and $150) and Half Marathon ($300, $150 and $75). Post-race, the top 3 will be recognized on the podium at the finish line festival, while the Marathon champions will also receive a unique engraved antique cowbell, an event tradition. The 4th San Luis Obispo Marathon + Half Marathon presented by LeftLaneSports.com will be held on Sunday, April 26 and will take runners through the town’s charming downtown corridor, out into the rolling hills of the renowned Edna Valley vineyards, then back into the city center and onto the iconic Madonna Inn property for a spectacular downhill, panoramic finish. The Family Fitness 5K , Children’s 1-Mile and Children’s Quarter Mile Dash takes place on the Madonna Inn property on Saturday, April 25.